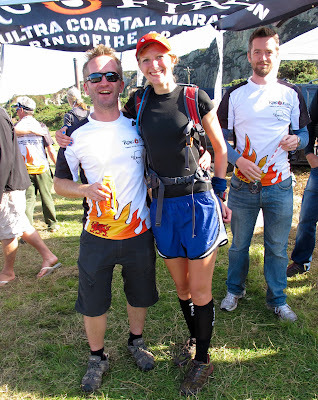 Jenn's Ultra Adventures! : Ring O' Fire - 131 miles! 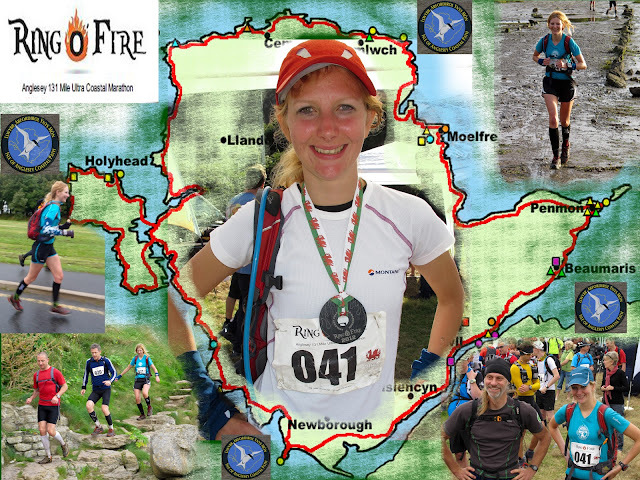 Ring O' Fire - 131 miles! I'm like a kid in a sweet shop when it comes to racing; I want to bag them all! I already had perfectly good plans for the weekend but when I saw a last-minute place going on the Ring O' Fire, I was right there! 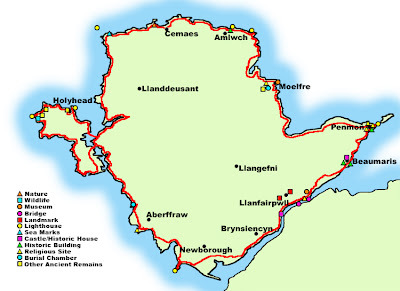 Anglesey had been the destination of 90% of our school trips but now I realised it was something more; the perfect race arena - one lap being 131 miles! The race was to start on the Friday afternoon with a 32 mile stage, then the big 64 on Sat and a little 35 miler on Sun, with plenty of pasta and naps in the village halls in between! The website said support teams were allowed, I'd never really had one before, but a quick call to Father Bear and Team Support were packing the van with kilos of pasta! 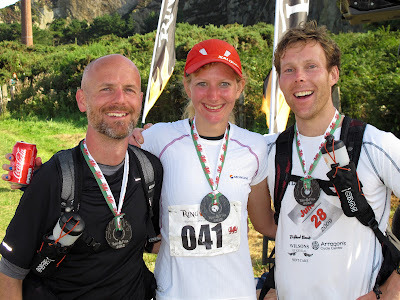 :-) I even drew the route on my map days in advance and thus felt the most prepared I have for any race before! I stuffed my rucksacks with an excessive range of trainers and lots of warm layers and ran for the train! It felt like my first day at school; lots of new faces, my shiny new Montane uniform and parents there taking photos! I wondered if everyone else was confident that they'd get round, I certainly didn't expect to and was just seeing how far I'd get! The plan was to take it steady Friday and Saturday, then if I still cared about my time on Sunday, I'd press on! After the obligatory play of Ring of Fire by Johnny Cash, we were on our way, all humming along, ensuring it was stuck in our head for the next few days despite nobody knowing the words! The way of out Holyhead was clearly marked with smiling marshalls and we were soon on the scenic coastal path we would be following all the way round! 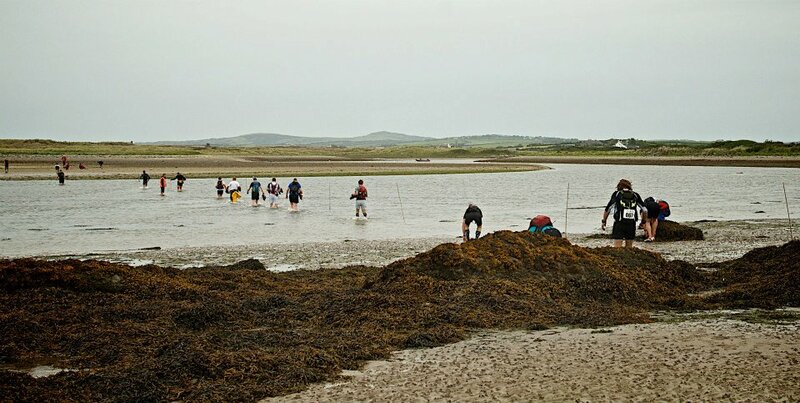 After leaving Holyhead Island, the first off-piste section of the route was encountered - an estuary! I removed my running socks and trainers but not my compression socks as it seemed like too much faff and from then on the survival epic of the feet began! 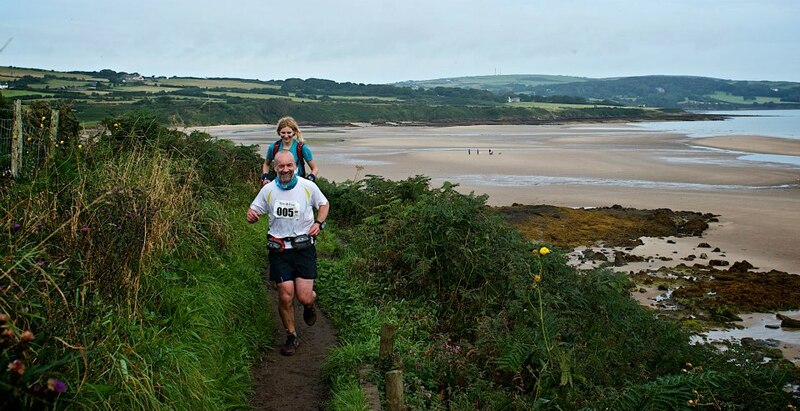 Running along the coast was amazing and the navigation was simple, just following the blue signs, so I relaxed and chatted to other runners as we steadily bagged the miles. 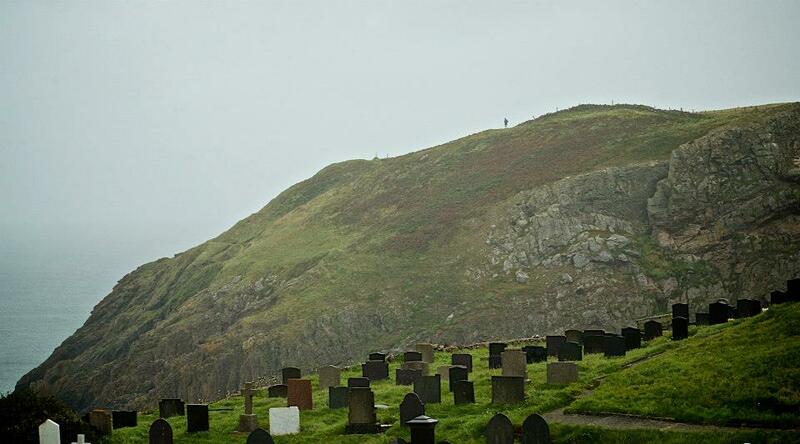 The views from the cliffs were outstanding and as the fog came in, it felt like we were the only ones out and about! Wlyfa power station, the final checkpoint, appeared out of the mist and then we were onto the last leg, thinking it we would be there soon! A local runner suggested it might take longer than we thought and we soon encountered the endless staircases up and down the cliffs, ensuring we'd had our workout for the day! Just as the sun went down, I made it to the village hall, where the wonderful support team had delicious pasta and sauce on the go! 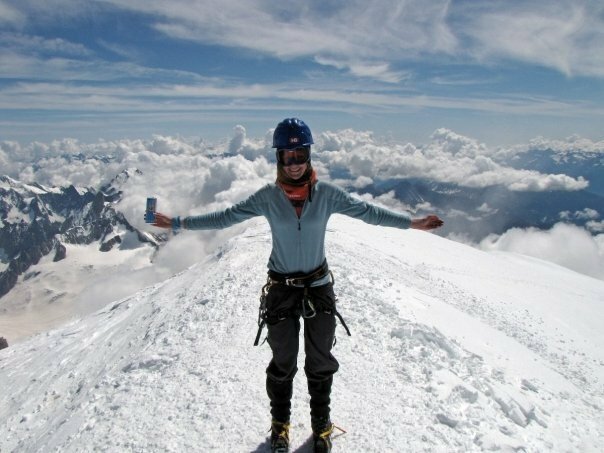 I curled up in my sleeping bag and hoped my legs wouldn't be sore tomorrow! Start of day 2 - still keen! Normally, the following day after an ultra is spent shuffling around and eating lots, but today, I lept out of my sleeping bag, shoved some muesli in my mouth and set off with vigour! 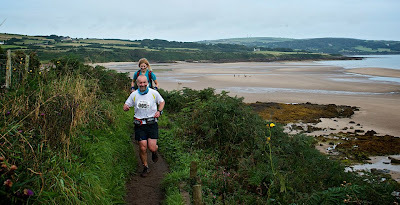 Perhaps too much enthusiasm, as for a few miles along the coast, I could still see the leading pack bolting along! I bumped into Dan and Pete and spent the rest of the morning running with them, feeling good and trying to save some energy for Sunday! 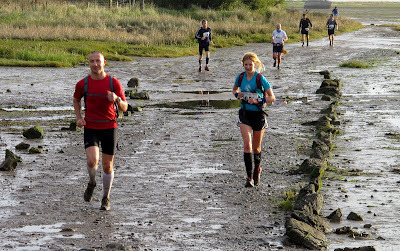 In a boggy section after checkpoint 2, a sharp pain arose from my toenails. I sat down and had a look at my feet...worse than a zombie horror movie! I put my socks back on and shuffled forth! 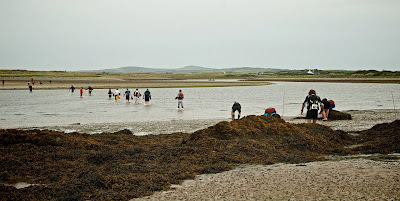 We arrived at the high/low tide option point and between four of us, couldn't quite decide what the tide was doing! 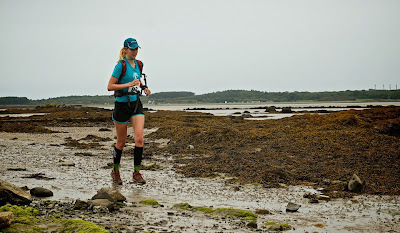 After having a high tide route adventure, we joined onto the coastal route again, which was a vertigo inducing wall on a beach, testing my limits of running in a straight line whilst consuming a gel without falling off! After leaving the coast, there was mass confusion by a blue sign being yellow and lots of runners clustered at a dead end! Eventually, everyone found the right track but in my hungry state, I soon got me and Pete lost again! I was becoming ravenous and gels were no longer doing the job, so we pre-ordered some cheesy pasta and tea from the amazing support team. 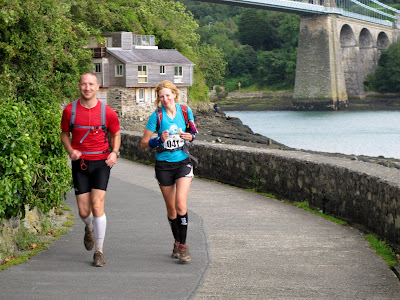 They were parked up just before Beaumaris, which felt like centuries away as we stumbled downhill to Penmon, stuffed our mouths with sweets and shuffled up the hill, dreaming of endless bowls of pasta, still occasionally humming the Ring of Fire tune. Reaching Penmon Point was a great marker in our journey, the North coast of Anglesey had been bagged and we were now heading South...somehow running South always feels a bit downhill, and after an amazing refuel, the miles were going to be consumed! Our enthusiasm was slightly damped by the rocky beach, which was hard to progress on and wasn't kind to the toenails! But it was fantastic to see the mainland, the sun shining along the Llandudno coast and the thought of seeing the next big milestone, the Menai Bridge kept us jogging along! Loving a bit of mud! Shuffling through Beaumaris, we got some strange looks and lots of questions! This spurred us on to look a bit more athletic and with 4 checkpoints under our belts, I started to think perhaps we'd make it through Saturday! A lovely bit of mud and some nice downhill roads later, the Menai Bridge came into view and it was too exciting! I lost Pete but had a great wade through the mud with Rich (who somehow survived a night out sleeping in the forest with Andy!?) before jogging on alone. Another high/low-tide option arose and making a decision seemed far too much.. I chose high as I fancied some uphill so there was an excuse to walk and eat a gel! I was starting to get tired and the sun was going down but the route was through lovely fields and knowing the East coast was nearly in the bag spurred me on. My Garminator said his battery was low and, despite all my excessive threatening, he eventually died and left me to guess the distance to the finish. A nice surprise at the Sea Zoo checkpoint was the most delicious rice meal you could ever imagine, thanks Anna! I wrapped up warm and Father Bear told me Chris, a keen ML100 runner was only 5 minutes ahead. Fuelled up and reheated, I decided to chase Chris down before dark so we'd be less likely to get lost! In the twilight, I kept imaging I was seeing him just ahead of me, but it always turned out to be a horse/post/nothing! The coastal path left the coast and went through many fields, most of which I did a few lengths of, getting a bit nervous of my nav and missing signs in the darkness. Eventually, I came to a large river, which I was meant to cross via the stepping stones. In the darkness, it felt like I was in the middle of nowhere and highly likely to be lost. I hadn't seen another runner for hours and I started to worry...I decided to sit on a rock and eat a protein bar, fairly sure I seemed to be on the right track, but then worried by the lack of signs and the scale of my map! Then, along came a young man named Barry! I'd never been so happy to meet a Barry before! 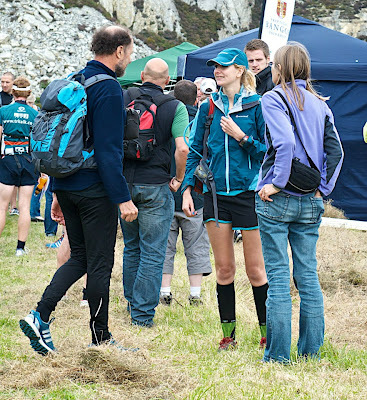 It turns out, I was snacking pretty much where the stepping stones were and I gladly hopped across them, chatting to Baz about all the races we have done/would be doing and it was great! ﻿ I was highly enjoying Barry's company, but when we hit the road 5 minutes after meeting, the pain of my feet was unreal! This was the only moment I'd ever thought I couldn't continue..and the thought of calling the support team seemed far too easy, with their warm van and delicious food! I said goodbye to Barry and told him I'd shuffle a bit further. However, as I shuffled on, wincing in pain, I realised Barry was still there and going at the same speed! I was chuffed and decided there was no way I was losing sight of him. We continued chatting and the soft, sandy path was much more forgiving...the momentary lapse in stubbornness to finish was over! :-) I was also really looking forward to Newborough beach, a fantastic place I love to go to, but when we rounded the corner, it looked a little different even in the dark...the tide was really high! The map said to traverse the beach but it seems we were a bit late for that, as the waves crashed against the sand dunes. Our only option was to navigate through the woods, we bumped into Chris and another guy and all made it to the crossing point to the lighthouse...but it looked like we might have to swim to that checkpoint! We called base who told us to skip that and we plotted a new route through the woods. It was quite disorientating at night, with the sound of the sea seemingly coming from all directions but finally we encountered a glow stick and we followed a trail to the final checkpoint of the day! Barry and I stuffed some food in our mouths and jogged on, knowing that the quicker we did the last leg, the more rest we'd get before the 6am start on Sunday...it was already Sunday! It was getting chilly now and I started to get a bit confused. I saw a baboons head on the floor and couldn't think of what else it was, I consulted Baz on the whereabouts of nearby zoos but he told me it was a runover hedgehog...I couldn't see it personally but knew he was definitely in a better state than me, so pushed really hard to keep up with him! I kept imagining finishing line flags, although I knew we still had a few kms to go and I kept having little dozes and waking up when my head nodded down, but somehow we were still jogging along! Barry's friend came to meet us and, after a little detour, took us to the cosy village hall. I couldn't believe we'd made it and Q gave us some delicious pasta before I curled up into my already laid out sleeping bag (thanks support team!) barely managing to take my waterproofs off before closing my eyes forever. The pain in my feet was unbelievable! Each toenail had moved out of place and had a blister under it, some toes stuck together by the juice they were leaking and my whole foot was white and prune-like! I hobbled to the support van, where my blisters were popped and bandaged whilst I devoured cheesy pasta like it was going out of fashion! There's no way I would have made it without Father Bear and Anna! With all this help, I was still somehow unorganised (we got in about 1.30am and the start was at 6am!) 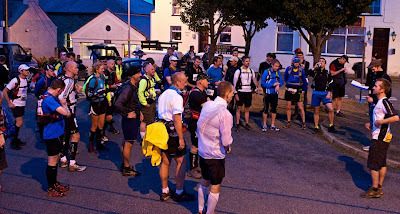 and vaguely shoved some things in my rucksack...I heard the call for the start outside as I was still in the village hall, so sprinted out to chase down the pack, knowing if I was left behind then motivation would be harder! In my rush, I forgot my map! Thankfully, support grabbed it and ran along to deliver :-) Surprisingly, after 100 miles, the legs felt okay as they had been feet-limited. 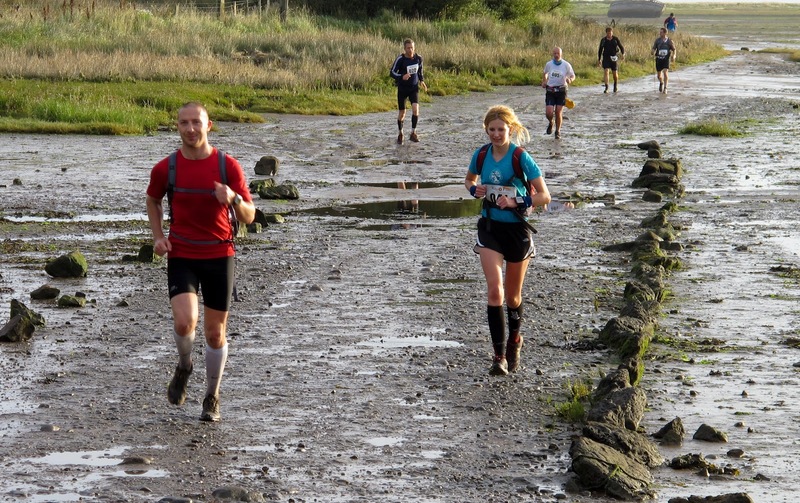 The team spirit of the surviving runners was great and we were treated to a wonderful beach route with views of Holyhead Island to spur us on! The coastal path then entered some fields and felt like it was going in every direction possible, then through a field with a sign 'Beware of the Bull'. I decided if a bull came charging at me, it could have me, I wouldn't even summon the energy to blink! Time for another energy gel! Stuffing our faces and waaay past remembering to smile for photos! 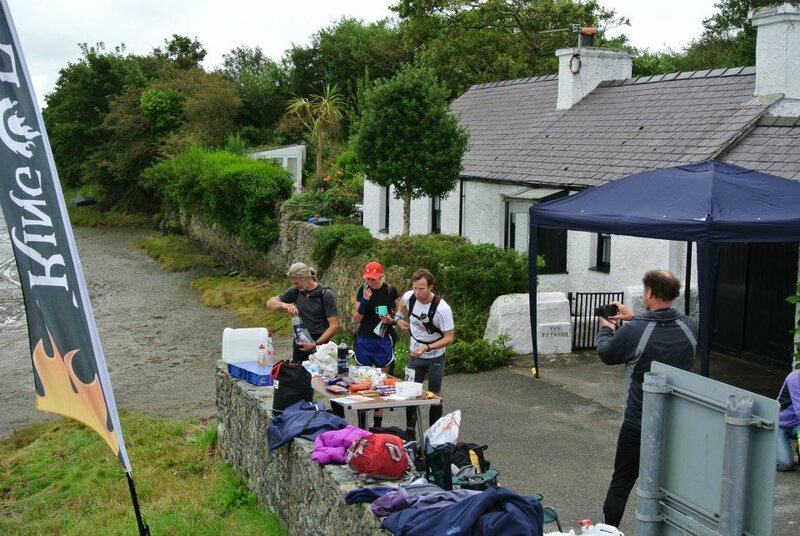 At the second checkpoint, several of us runners clumped together, including Barry, Chris, Alan and Mark. 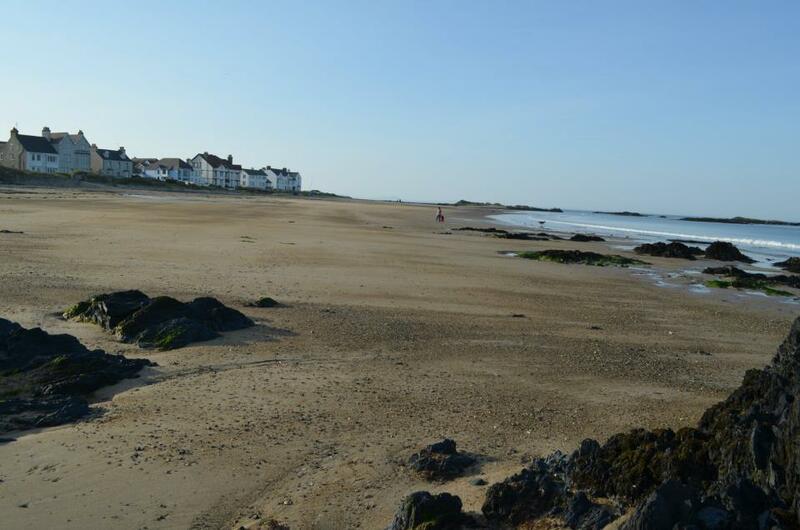 We had a lovely shuffle along more coastline discussing woodwork, business and physics! It was along this stretch of coastline, I really developed my ultrarunning-shuffle. I was pretty much walking but in a funny light-footed dance and wafting my elbows high when a passer by asked how far we'd gone...about 122 miles I said, they looked as us like we were total nuts, then I realised we probably are :-) We shuffled down the hill to the last checkpoint! It was amazing to know we were on the final leg, but it was far from over! We could see Holyhead Mountain looming right in front of us, but the coastal path took us the scenic route there of course! It felt like a family day out running with Alan and Mark on this final stretch. Alan, the father figure, constantly checking we'd had enough gels and water, whilst Mark, the grumpy teenager quietly lagged behind. The views were stunning at this point; a magnificent lighthouse balanced on cliffs, super blue sea shining in the sun and some amazing climbing routes that are now on the to do list! Final miles excitement kicked in and I bounded up the final peak! I put my map away and just ran as fast as I could to the noise of the finish, totally unable to believe I was going to make it! Flying down the final descent, I realised I was approaching from the wrong direction -oops! But I'd made it, it was brilliant to be back in Holyhead and know that we'd done a whole lap of Anglesey on our own little legs! What a weekend!!! Mark cracks out the smile! ;-) Bit of Welsh sunburn for me. Alan managed to smile the whole way! Father Bear likes Photoshop! The blue signs became the stuff of nightmares...just look at that evil seagull about to attack!! 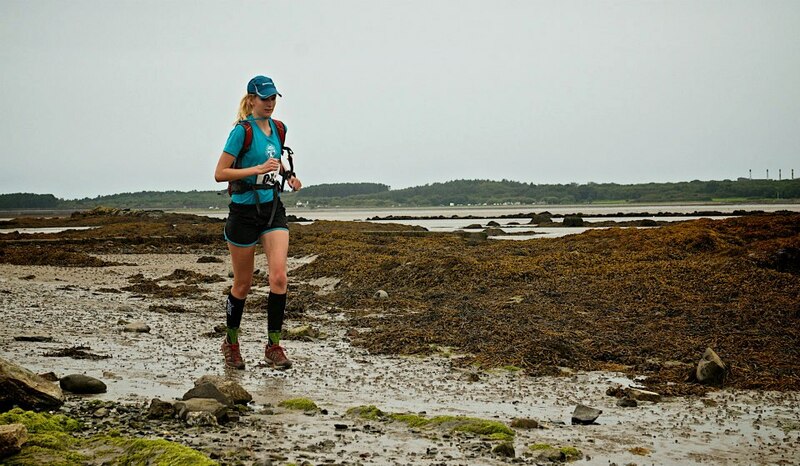 For several days, I had a recurring nightmare of running along an endless coastal path...I'm sure my legs were still shuffling along! Many toenails decided they'd had enough and ejected, along with quite a bit of foot skin! My level of optimism about running distances has reached an even higher high! The Ring of Fire song now induces extreme lethargy or excitement at random.